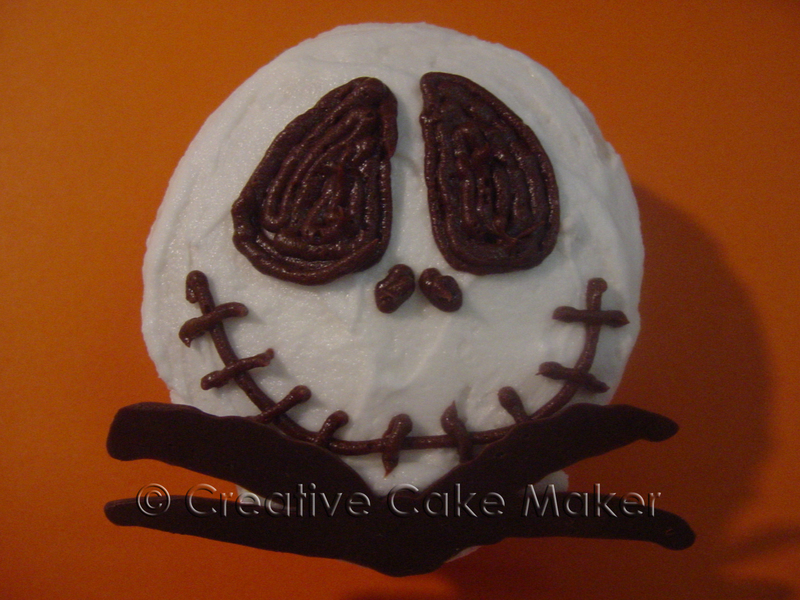 The last thing I ever thought I'd be making for my 4-year old daughter was Jack Skellington cupcakes. But there I was, at work, dreaming up cupcake ideas. This was during my daughter's 4-month stretch where The Nightmare Before Christmas was her favorite movie ever. Now, keep in mind, I prefer making cupcakes that ARE something rather than cupcakes with something on top. (For instance, the cupcake is a balloon rather than a cupcake with balloons on top.) So I was thinking, "What is round? I already did a ladybug...Jack's head is round! That would be perfect!" As soon as I got home, I pulled out some paper and started drawing "cupcake" circles. The first circle was for Jack Skellington. I was pretty happy with the results - especially when my daughter came over to see what I was doing and immediately recognized "Jack". She staked claim on the 1st cupcake I completed. The hard part was getting the facial features just right. It had to look like "Jack"...not just any ol' skeleton. Once the drawing was done and I had a good idea about the design, I started to make them. These were very easy to make. The most difficult part was the bat collar (or spider or whatever - my daughter would know). I made that with melted chocolate candy wafers. Melt some wafers til smooth and place in a Ziploc bag. Snip off a tiny bit of the bottom corner and "draw" the collar onto the shiny side of some wax paper. Basically, it is a circle with "wings" coming off it. They don't take long to set, but it's a good idea to do these first. Ice the cupcakes in white, pipe on the facial features with chocolate icing (because black icing tastes TERRIBLE). I say pipe on the features because it is so much easier than spreading the chocolate around to get the eyes right. If you're making a lot of these, you'll want the simplest way possible. Add the bat collar to the cupcake (hold it in place with a dab of icing) and you're done! Enjoy! I'm glad to know my 4 year old isn't the only one who did (is still doing!) the Nightmare thing...she wants this as her b'day party theme so this is fantastic. Thanks! Well, I have one 10 years older than yours, and she is still lovn' Jack she wants it as a b-day theme. Where did you find the balloons and party supplies? I LOVE the cupcake idea. This would be perfact for my husband (big kid tht he is) who loves this movie! Thanks for a fun creative way to celeabrte his birthday with his platoon!! !